A highly portable, Intel-powered laptop – isn't that an Ultrabook? Well not in the case of the Pavilion m6. It's a 15.6-inch notebook that loses out from conforming with Intel's Ultrabook spec by virtue of various factors – not least the fact it has a standard large capacity hard drive rather than an SSD. It's a powerful thing, with a whopping 8GB of memory and a next-generation Intel Core processor. Up against the also new HP Envy Ultrabook, the m6 doesn't look a whole lot different - meaning you get a really thin and powerful notebook for a perfectly reasonable outlay. You also get a numeric keypad as well as a fingerprint reader for added security. As you'd expect from an HP mainstream entertainment laptop, it features Beats Audio and can come with beefed-up discrete graphics should you choose that option. Eight hours of battery life is promised, though we're really not sure you'd actually get that in practice looking at the spec sheet. As you can see, it's got a full array of ports including HDMI, Ethernet and four USBs. There's also an optical drive - although, as you can see we were looking at what is probably a very early sample which had an ill-fitting drive faceplate. We really like HP's recent keyboards and the keys on the m6 gave us little reason to change from that view. However, we really weren't a fan of the mouse buttons - the press seemed far too deep - it needed a decent press as opposed to the quick click that many laptop mouse buttons have. Design-wise, it has a brushed aluminium shell and certainly looks rather smart. HP says it reflects a refresh of the company's notebook design philosophy called Mosaic which, it says "includes rich colours, premium materials and purposeful shapes". 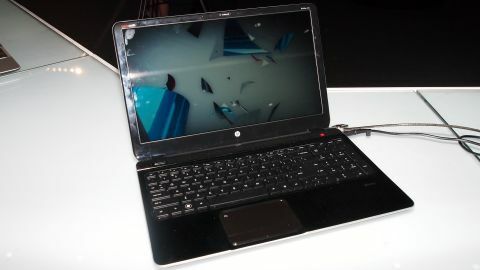 The HP Pavilion m6 release date is June with a starting price of €649 (about £520 or £840).